1　We serve the freshest fish! 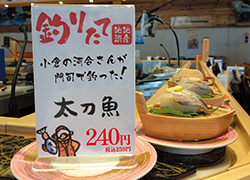 We have a wonderful fish-tank, and you can enjoy fresh fish from the tank as "Ike-zukuri". 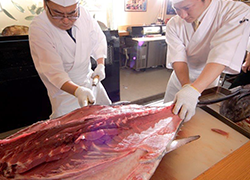 And, in our Otemachi shop, when we cut up a tuna, it is so powerful that it's very popular among all customers ! 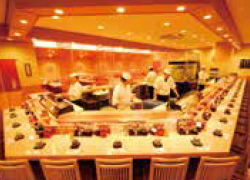 2　The conveyor-belt sushi that every customer from adults to children can enjoy! We selected interiors carefully for customers to relax and enjoy our shops. 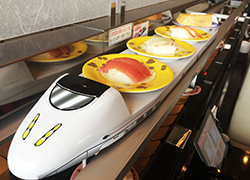 Our shops introduced a touch panel order system and you can order food by a special lane in the image of a shinkansen, so you can enjoy without waiting! And there are games where you can earn - for example a service ticket. 3　We buy fish which you caught! It's good news for people who are good at fishing ! 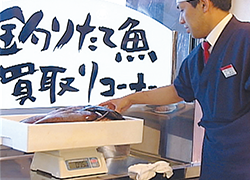 "Heishirou Group", we love fresh fish, and will buy the fish from you which you catch. 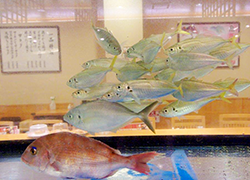 All you have to do is bring fish in alive to one of our shop (excluding Canal City shop). Please read this page if you want to know more about "Buying fish".